After his media junket in New York City last week to promote the Sunday night premiere of American Idol on ABC and playing three concerts on his “What Makes You Country Tour,” Luke is now in Australia for his first-ever concerts down under. His touring year will conclude this fall after headlining concerts across North America including some of the biggest and best sports stadiums in Toronto, New York City, Cincinnati, Tampa, Pittsburgh, Boston, Minneapolis, Los Angeles (the first country concert to ever be held in Dodgers Stadium), Denver, St. Louis, Chicago, Vancouver and wrapping the tour in Detroit at Ford Field on October 26. Country music superstar Luke Bryan is a two-time Academy of Country Music and Country Music Association Entertainer of the Year and a five-time host of the ACM Awards. Luke has more certified digital singles than any other country artist with 40 million tracks and 12 million albums with three Billion music streams and he was the most-streamed country artist from 2012 to 2016. Luke has placed 19 singles at #1, 11 of which he co-wrote, and has headlined arena tours and sold-out stadiums across the U.S. and performed for 1.5 Million fans in 2017. Country Music News Blog participates in advertising programs that help fund the operation of this site. For more information please visit our privacy statement. 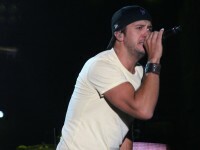 This entry was posted in Luke Bryan, New Music, Press Releases by Shauna "WhiskeyChick" Castorena. Bookmark the permalink.